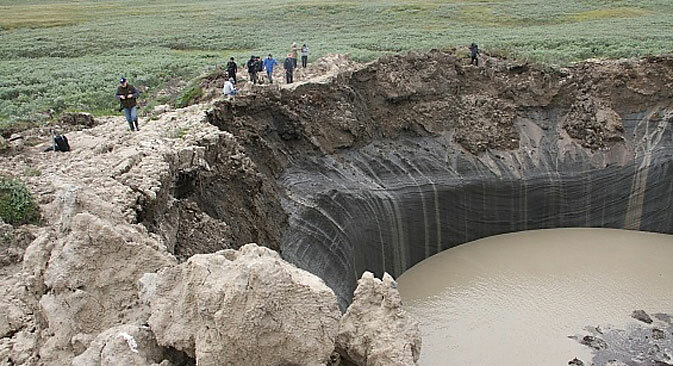 A Russian scientific expedition has concluded that a gigantic crater discovered in summer 2014 in the Yamal Peninsula in Western Siberia has begun turning into a lake. Over the past year the crater has filled with water and is now 10 meters deep. Scientists had earlier suggested that the mysterious crater, which was found in 2014, would turn into a lake. Vasily Bogoyavlensky, the head of the expedition and a researcher at the Russian Academy of Sciences’ Institute of Oil and Gas, told RBTH that several Arctic seas might have resulted from similar circumstances. Researchers have also proposed a new hypothesis: that the origins of most round-shaped tundra lakes on the Yamal Peninsula are linked to thermal gas. According to Bogoyavlensky, the process takes place on territories where there is paleo-congelation and the presence of underground ice. As a result of climate change, hills are emerging on these territories up to two kilometers in diameter and dozens of meters high. In 2014, three expeditions were dispatched to study the crater. All of them came up with different theories as to the origins of the phenomenon. The first one was proposed by scientists from the Trofimuk Institute of Petroleum Geology and Geophysics in Novosibirsk. According to these researchers, the zone where the crater is situated is located at the junction of two large faults that cross the peninsula. They think that the environment was heated by warmth coming up from the Earth’s core along the cracks in the crust, as well as from above due to the warm summer temperatures in 2014. There was also an emission of gas hydrates, which are present on the peninsula both deep underground and on the surface. The scientists believe that these are the same processes that occur in the Bermuda Triangle. Where are the craters located? The biggest crater is located approximately 30 kilometers from Bovanenkovo (70°26’17.00″N 68°19’27.00″E), on the territory of a large gas deposit. The hole's diameter is about 40 meters, but it is gradually increasing. Indirect signs indicate that the orifice could have appeared in spring 2014 or fall 2013. The second crater (69°9’56.22″N 74°34’14.87″E), which, just like the third was noticed by deer herders, is located near the Antipayuta settlement and most likely appeared in September 2013. The third oone (70°9’58.57″N 82°20’2.20″E) was discovered in April 2012, but only recently became well known. The second and third orifices are similar in dimension: their diameter is about 15 meters. One of the "new" crater is located 10 kilometers from the deposit in Bovanenkovo.